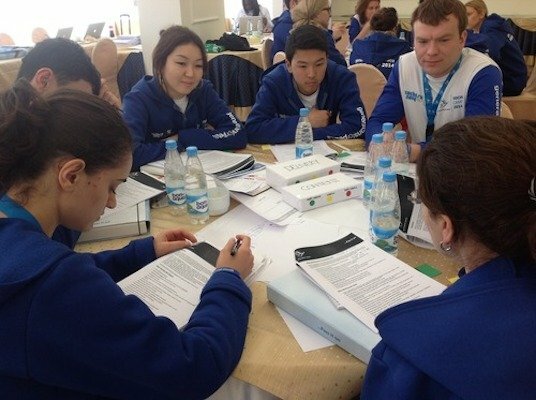 Delegates returned bright and early to Day Three of Sochi Camp 2014, ready for a day filled with both theoretical content and practical application. The morning focused around developing the ideas behind their programme and practising how to work with different Target Groups. This helped them clarify that their proposed ideas made sense, and helped them focus on the changes they wanted to see in their programmes. It also gave them a way of assessing, at the end, whether their programme actually functioned according to their theory or if this theory needed to be revised. There was some great discussion and feedback at the end of this session, with each country presenting the conflict they wanted to work on and the Theory of Change they had decided on. We had some really interesting answers, ranging from theories that addressed violence amongst Syrian and Jordanian children to theories that addressed delinquency in Bosnian schools. This really captured the range of the work GFP Delegates were preparing to do at the end of Sochi Camp 2014!